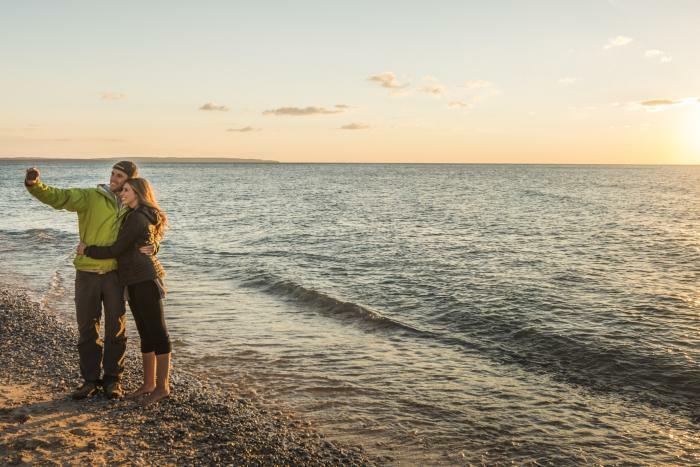 The Sleeping Bear Dunes National Lakeshore is the most popular single attraction in the Traverse City area, and it’s a rare visitor who won’t trudge up the Dune Climb, motor along the Pierce Stocking Scenic Drive or frolic on the beach at Good Harbor sometime during their stay. But there’s also a vast section of the park to the south of these marquee attractions that’s every bit as stunning – and in some cases, even more accessible. With one exception, it’s also one of the least crowded parts of the lakeshore. It’s the Platte River District, which stretches from the village of Empire to the park’s southern boundary near Point Betsie. The best-known attraction in the Platte River District is the place it’s named after. The Platte is a gentle meandering stream that attracts kayakers, canoeists and float-tube enthusiasts all through the warm-weather months. They love the leisurely two-hour trip through a landscape of waterfowl and wildflowers, ending with a dramatic finish at Platte Point Beach where the river pours into Lake Michigan. Lots of people come to the beach even without their paddles, since there’s a wonderful township park and picnic area there – and the nearby Platte River Campground is one of Sleeping Bear’s two full-service camping facilities. Kids love to play in the river, and the view across Platte Bay to the dunes is a magnificent one. In fact, the scenery along these southern beaches is some of the best in the entire park, and the beaches themselves are splendid in their isolation. Platte Point Beach draws a faithful crowd of beachcombers, especially on summer weekends. So does Esch Beach, a popular swimming area at the mouth of Otter Creek, about midway between Platte Point and Empire. On days when Lake Michigan gets chilly, visitors enjoy walking up the warm, sandy-bottomed creek into a lush coastal forest and wetland. But there are more remote beaches on either side of these better-known spots. Peterson Beach is the best-developed of these, since you can actually drive to it (on unpaved and sinuous Peterson Road) and there’s a boardwalk that takes you across the low dunes separating the parking lot from the beach its. It’s remote, but the views are awesome. If Peterson Beach is still too well-known for your tastes, the same scenery can be found a little further to the south at Tiesma Road Beach, which is unmarked on the official maps and has no developed facilities. For that matter, the entire two-mile stretch of beach west of Platte Point to the park boundary is undeveloped and pristine. Even some of the park’s most devoted visitors are unaware of the hiking and camping opportunities in the Platte River District. 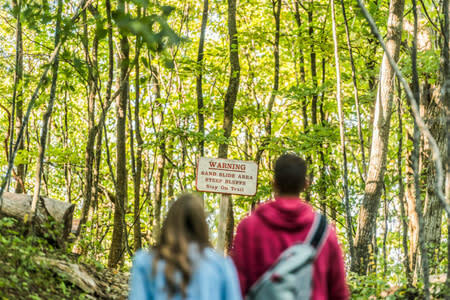 For the most part, trails in this part of Sleeping Bear are deeply wooded and relatively flat, with occasional lookouts and access points to the Lake Michigan beaches. The Old Indian Trail, just inside park’s southern boundary, consists of two loops through a deep maple-beech forest, each about 2.5 miles long. It may actually be more popular in winter when it attracts a lot of cross-country skiers and snowshoe hikers. But the big trail system in this part of the park is the Platte Plains Trail, a sometimes bewildering 15-mile labyrinth of trails through a pine-oak-aspen forest that includes two lovely inland lakes (Otter Lake and Bass Lake). 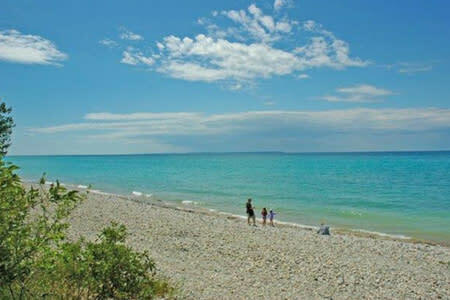 It’s also home to the White Pine Campground, the only backcountry camping area on the Sleeping Bear mainland. In this wilder part of the park, it’s easy to forget that Sleeping Bear was once a well-populated area, but there are exceptions. The former logging port of Aral, located behind the beach at Esch Road, flourished from 1881 into the early 20th century. At one time it boasted a sawmill, two boarding houses, a post office, church, school and general store. Aral was also the site of a famous 1889 murder, when the hot-tempered owner of the local sawmill shot and killed two lawmen who had been sent to place a lien for unpaid taxes on some of his logs. (He was sentenced to prison, but released later by order of the state governor.) In its final years Aral was an outpost of the House of David, a hard-working religious group famous for their long beards and unbeatable baseball team. 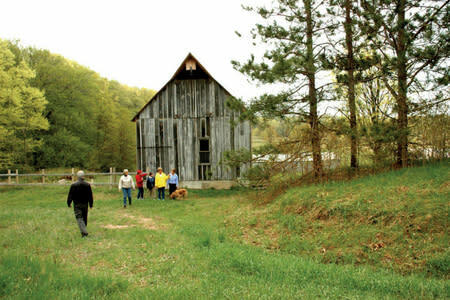 There are a number of farmsteads still standing in this area, and probably the best is the Treat Farm, located just a mile or so south of the popular Empire Bluff Trail. A half-mile footpath from Norconk Road leads to the well-preserved homestead of Charles and Martha Treat, who moved here in 1912 and farmed this land into the 1930&apos;s. The handsome white farmhouse stands on a short bluff overlooking wide meadows to the south, surrounded by a collection of fascinating outbuildings – including a strange circular garage built of concrete with a domed roof. Another half mile to the west is a steep bluff known as Old Baldy, which offers the adventurous climber a splendid view of the lake and the shore of Platte Bay all the way to Point Betsie. Standing at the top of the path, the wind rushing past your face and the golden curve of the beach hundreds of feet below you, you’ll feel like an eagle poised above an abyss of deep blue space.